While not exactly manna from heaven, Essene or manna bread comes close to being the most perfect bread there is on the planet. It is simple, nutriitious, and delicious, and has been the original form of bread for many peoples for thousands of years. Our modern day bread simply cannot compare with it in terms of nutition or wholeness, yet it is not widely eaten, especially here in the Western world. Essene bread derives it's name from the ancient Judaic sect known as the Essenes who flourished from the 2nd century BC to the 1st century AD and who lived a very ascetic lifestyle. They practiced vegetarianism, fasting, communal living, and the healing arts. They also embraced reincarnation, astrology, and other related disciplines now banned by the Christian Church. They formed for the particular purpose of birthing avatars or Christed individuals onto the Earth plane. Essene bread was one of their staple foods. Jesus himself was an Essene and partook of this wholesome bread. 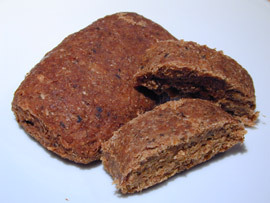 Traditionally, Essene or sprouted bread was made by grinding berry roots between rocks or millstones and laid to bake on stones heated by fire or the scorching sun. 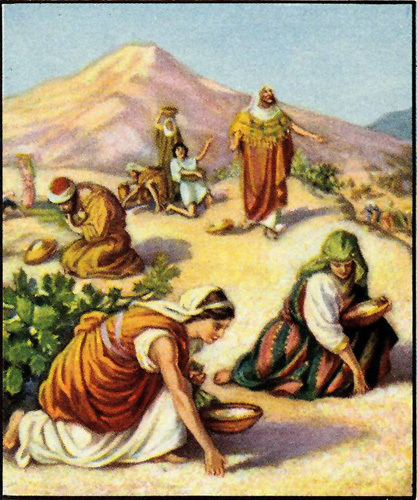 This is how, for example, the captive Hebrew tribes in ancient Egypt made their bread. In the Essene Gospel of Peace, a 1st century Aramaic manuscript, the Master gives the following instructions on how to make the bread. Today's Essene bread is produced with the same two simple ingredients -whole sprouted grain berries and pure water. The grinding and baking however are done in a slightly different manner, using more modern technology(food processors and ovens), especially in the cold or northern zones of the planet where the required heat is not always available from nature..
Today's modern mass-produced bread is a far cry from the original bread of the ancients, consisting of bleached and demineralized white flour, ordinary(and often polluted) water, hydrogenated vegetable oil, yeast or baking soda, lard or butter, and chemicalized table salt -all injurious to the health. While healthier whole-grain breads have been re-introduced into the mainstream market in the past few decades, they still cannot compare to essene or manna bread. Ezekiel bread is similar to manna bread except it is made with yeast. Essene, Manna, Ezekiel, or sprouted bread is available in most health food stores(in the freezer) or can be ordered through the internet. It is more expensive than ordinary bread, but takes more time and care to produce, and the benefits are well worth it. Buy only organic whole grain(usually wheat) berries(two cups for one loaf), rinse, and put in a glass jar, ceramic bowl, or pot. Fill with clean water(twice the volume of the berries), place a lid(or screen or netting) with holes in it for aereation, and let soak overnight(at least eight hours). Drain in the morning and rinse at least twice a day for 3 to 4 days, shaking the berries to prevent matting and spoiling. Allow the sprout hairs to grow at least the length of the berries and/or to be sweet to the taste before grinding. Grind into a paste(a juicer or food processor will do), knead and shape into round and generally flat loaves and put on a oiled or sesame seed-laden cookie sheet (to prevent sticking) and bake at low temperature(160-250°) for three to four hours or untill browning occurs. Let cool and store in sealed plastic bags. Refrigerate or freeze only if intended to keep for more than three to four days. Cut with a wet and serrated knife, and enjoy! Finally, a pure and delicious bread with no salt or chemicals in it. You can add honey, seeds, or chopped nuts or fruit when making your bread, or eat them side by side, or you can just eat the bread alone as it has a sweet and satisfying taste all its own.